Near the Old Port. Tel: (05)330419. Originally built in the 14th century on the site of an earlier Byzantine castle. Rebuilding carried out during the Ottoman period. According to tradition Richard the Lionheart married Berengaria of Navarre and crowned her Queen of England here in 1191. 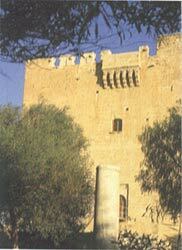 The castle houses the Cyprus Mediaeval Museum. Interesting collection of antiquities found in the Limassol area from the Neolithic Age to the Roman period. 253 Ayios Andreas St. Tel: (05) 362303. This very beautiful collection of Cypriot Folk Art of the 19th and early 20th century is housed in a restored old house. 14 km west of Lemesos on the road to Pafos. A fine example of military architecture originally constructed in the 13th century, and subsequently rebuilt in its present form in the middle of the 15th century. After the fall of Acre in 1291 it served as the Grand Commandery of the Knights of the Order of St. John of Jerusalem. In the 14th century it came for a few years under the domain of the Knights Templar. Nearby are the ruins of a sugar mill dating to the 14th century. An important ancient city kingdom, and one of the most interesting and spectacular archaeological sites on the island with excavations still bringing new treasures to light. The magnificent Greco-Roman theatre was originally built in the 2nd century BC and enlarged in the 2nd century AD. It is now fully restored and used for musical and theatrical performances. The House of Eustolios was originally a private villa and in the early Christian period became a public recreation centre. It consists of a complex of Baths and a number of rooms with beautiful 5th century AD mosaic floors. 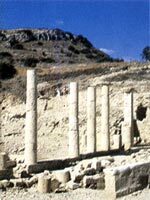 The Early Christian Basilica dated to the 5th century was probably the Cathedral of Kourion with a baptistery attached to the north side. The House of Achilles and the House of the Gladiators have beautiful mosaic floors. The Nymphaeum dedicated to water nymphs is still under excavation by the Cyprus Department of Antiquities. The Stadium lies 1 km to the west on the right side of the road to Paphos, and is dated to the 2nd century AD. Apollo Hlatis, God of the Woodland, was the protector of the city of Kourion. Archaeological evidence shows that the cult of Apollo was celebrated here from the 8th century BC to the 4th century AD. Part of the temple has been restored, with the cella, the colonnade and the pediment. One of the ancient city kingdoms of Cyprus, where, according to legend, Theseus left the pregnant Ariadne to be taken care of, after his battle with the Minotaur. A very important cult of Aphrodite-Astarte flourished here. Excavations are still continuing at the Acropolis and Agora areas as well as part of the upper and lower city. The remains date from the Archaic, Roman and Christian periods. This is a complex of two churches. The older one, possibly dating to te 12th century, is on the east side and is a cross-in-square domed church. The second church on the west side was added in the 14th century and built in the same architectural style. The surviving mural paintings date back to the 14th-15th centuries. Germasogeia is an important municipality in the Lemesos area. The church of Agia Christina, which lies in the centre of the village, also houses the Germasogeia Ecclesiastical Museum. It is a small church with a flat roof, the outcome of several recent interventions. Recently restoration work has revealed 16th century wall paintings. Off the Lefkosia-Lemesos road 19 km from Lemesos. Originally founded in the 12th century. The nuns, besides performing their religious rites, spend their time in icon painting and cultivating flowers and herbs, and the production of honey. A series of important Byzantine monuments, e.g Panayia Amasagnou, Timios Stavros - Kouka, Archangelos Monagri, can be found along the Kourris valley, about 20 minutes from Lemesos. The vaultedl church of Panayia tis Amasgou belongs to the 12th century and is covered by a second roof made of wood and tiles. The monastery is now run as a nunnery. 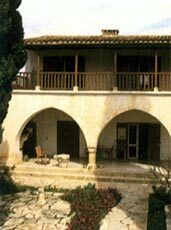 The Archangelos at Monagri was built in 1740 on the foundations of an older monastery that was burned down. 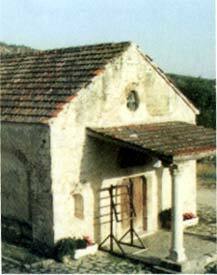 Of interest is the painted-wood carved iconostasis and the nearby olive oil mill of the Roman period. The nortern buildings of the monastery have been renovated and turned into a Centre of Contemporary Art. 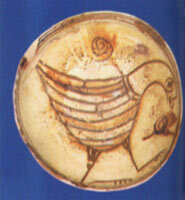 Timios Stavros at Kouka has an excellent example of the Palaeologian style on a wall painting of the 14th century. Not far away is the picturesque village of Laneia, a favorite with artists.